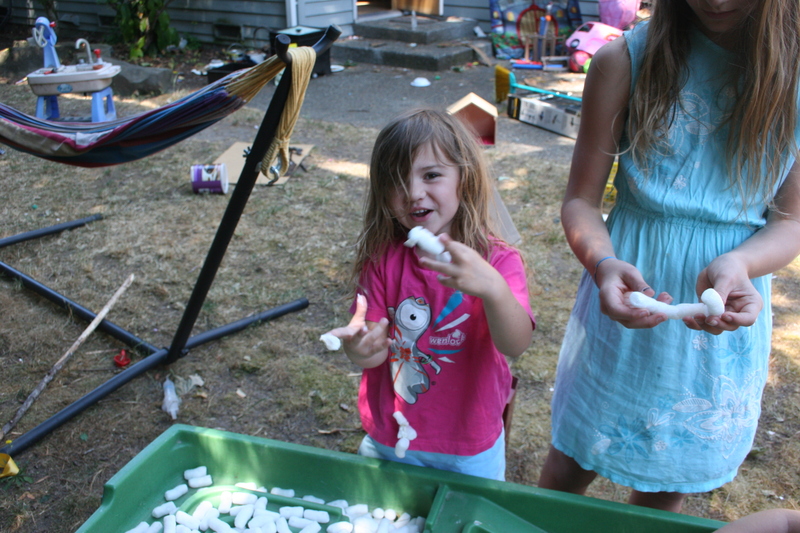 Scrap Workshop:What do children learn from playing with boxes and scrap materials? 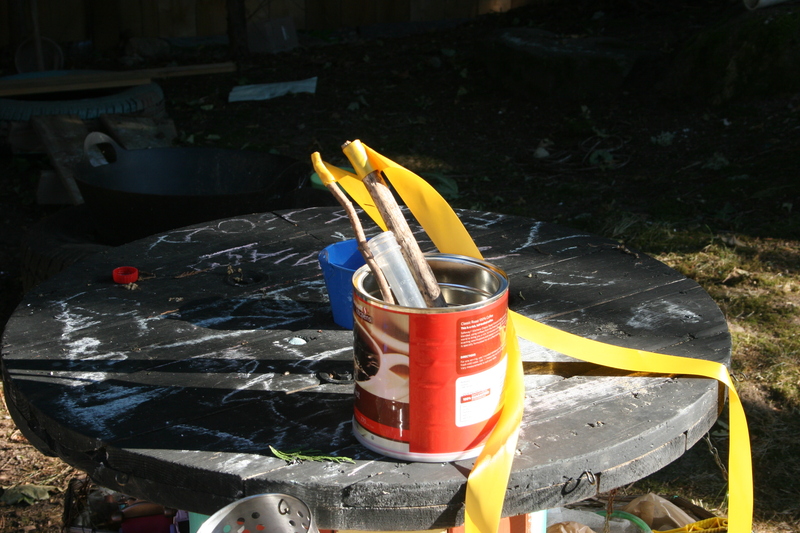 One of my favourite workshops to lead at a local play centre was scrap workshop. I liked it because it was suitable for all ages, it was a natural extension to my heuristic play workshops with toddlers and it gave children the freedom to develop both creativity and skills. We collected all kinds of scrap materials, large and small and displayed them in separate containers. How could you be rescued from a desert island? but best of all we would make sure there was plenty of tape, string, scissors and markers and let them create and explore. ‘ When children engage with people, objects, ideas or events they test things out and solve problems. They need adults to challenge and extend their thinking. (EYFS 2008 – Active Learning). How can you balance 3 boxes without them breaking? Provide flexible resources that can be used in many different ways to facilitate children’s play and exploration’ (EYFS 2008 – Supporting every child). Active learners need to have some independence and control over their learning to keep their interest and to develop creativity.’ (EYFS 2008 – Active Learning). and made discoveries using all of their senses. An open-ended project like this gives plenty of opportunities to observe and work alongside children, guiding them towards their next steps and sharing ideas together. This child wasn’t interested in joining pieces or making anything. They explored filling and emptying. This child wrapped and wrapped their construction with tape. They went on to wrap their hands with string. We provided them with materials they could explore wrapping in more depth – paper sheets, tape, string, ribbons , blankets, paper strips with tubes, poles, boxes, and table legs wrapped in string. ‘ Children need and will respond positively to challenges if they have a good relationship with the practitioner and feel confident to try things out.’ ( EYFS 2008 – Supporting learning). The children were able to work in mixed ages. The youngest children were 2 and the oldest 10. All the children enjoyed the workshops and learned from and supported one another. 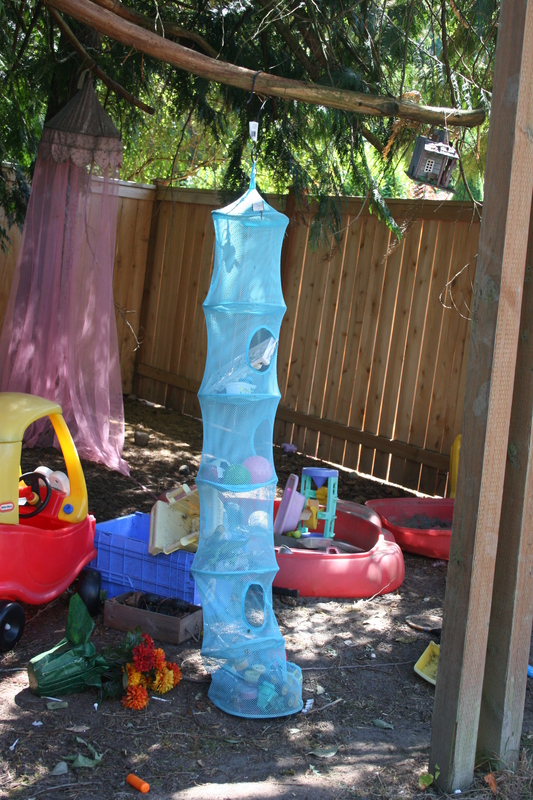 ‘ In their play children learn at their highest level’ (EYFS 2008 – Play and Exploration). I believe that sometimes we try too hard to arrange things for our kids to do and it is important to let them be. There are however, some things that I feel we should introduce our children to. The simple pleasures that we had as kids, are sometimes forgotten and lost. If we are going to teach our children anything, lets preserve simple pleasures like these. You’re My Kind of Mum Friend Because…..
A few weeks ago I went for a walk to the park with my daughter. She likes to climb to the top of the climbing frame and play pirates. The game involves roaming the edges of the park for interesting treasures and on this day, she discovered big rocks. She proceeded to pick them up and roll them down the bank, watching them crash at the bottom. The only other child at the park was a little younger than my daughter and after observing her for a while, she found her own rock. She used all of her efforts to lift the rock and proudly show it to her mum. At which point, she was greeted with a look of horror and her mum quickly took the rock away and ushered her to ‘more suitable’ pursuits. This kind of reaction is very familiar. When my children were toddlers, other parents would often ask me if my children were okay when they climbed a ladder and slid down the longest slide, as I observed from a distance. I have never been a parent to shadow my child’s every move and rarely feel the need to step in. It is always refreshing to find a parent who shares my attitude. On a recent trip to the park with a friend, I was so happy to find someone who not only didn’t bat an eyelid when my eldest started paddling barefooted in the cold wet mud but actively encouraged the others to join in. When the children threw rocks on the ground to see if they would break , she gave them advice on how to do it safely, rather than stopping them because it was too dangerous. You are my kind of mum friend because you let all these experiences happen. It’s fun to stand on the roundabout, when we fell, we worked out how we needed to balance to stay on. When you are 5 you can climb a big rock without any help. I can test the ice if I stand on the edge and throw sticks to see if it will break. I explore the size of the ripples as I throw stones into the pond. If I get too close I might get wet and the water is cold! Mud is good – the squishier the better! We don’t need a swimming costume to get wet. Who can find the biggest branch? Don’t tell me it’s cold, I need to feel it! It’s okay to play – even when you’re almost 12. If I ride on my coat, I go faster. It’s okay to remove your shoes and coat when it isn’t quite Spring. Take off your shirt and play with a stick. I’m going to have a shower. I’m getting very wet, now the rain is staying on me. And when you let these things happen, with a little bit of support they will have the courage to jump. 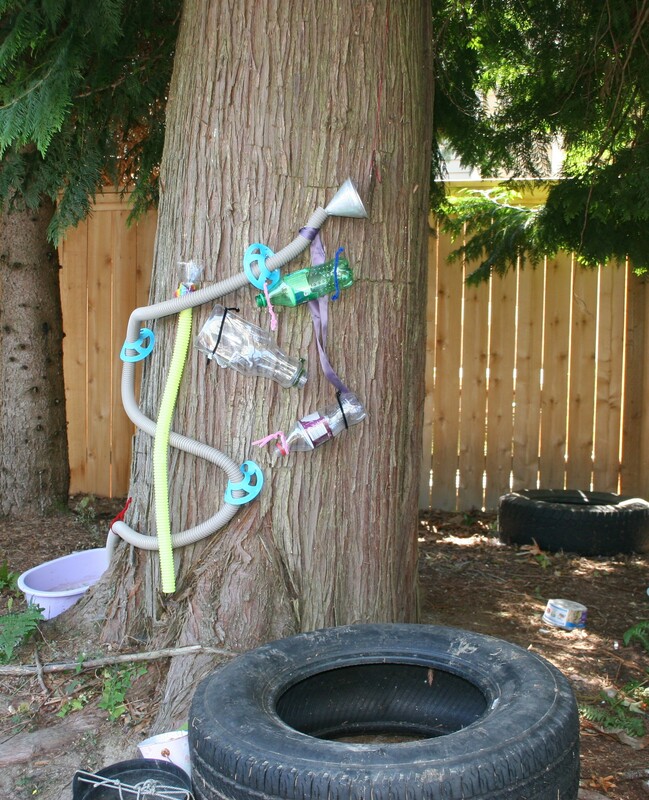 How to Create a Low-Cost Outdoor Playspace in Your Own Backyard. I recently hosted a party for friends and their families. I was surprised at the comments I received about my garden being an exciting place for children as I often think of it as small with too many trees and very little grass. 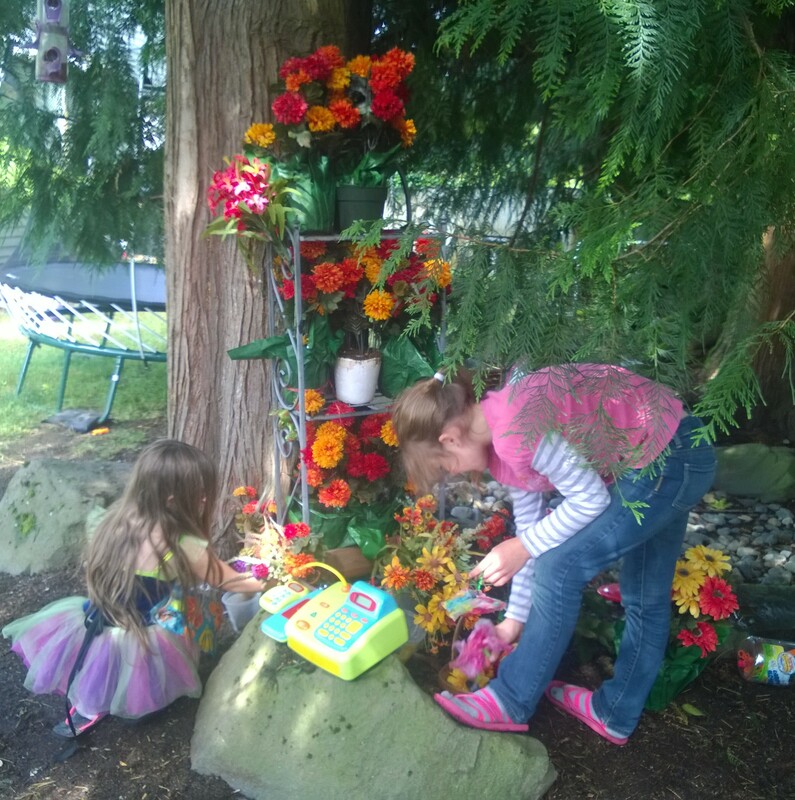 I’ve worked hard to make it an enticing play space and most of the materials have incurred little or no cost. Here is a little tour. The water wall is a recent project. The pipe came from an old vacuum cleaner and the other containers are empty bottles. 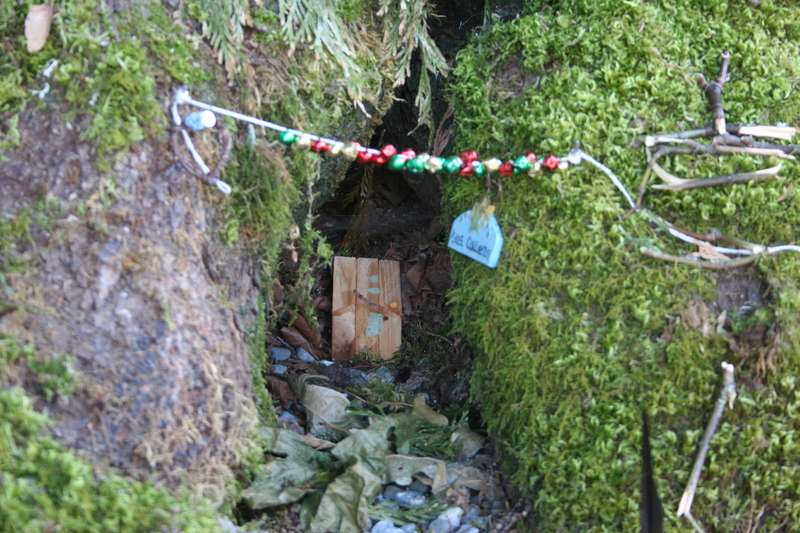 The containers are fastened to the tree using nails and pipe cleaners or threaded through markers for obstacle courses. The tyre at the base is to help my youngest daughter to reach. 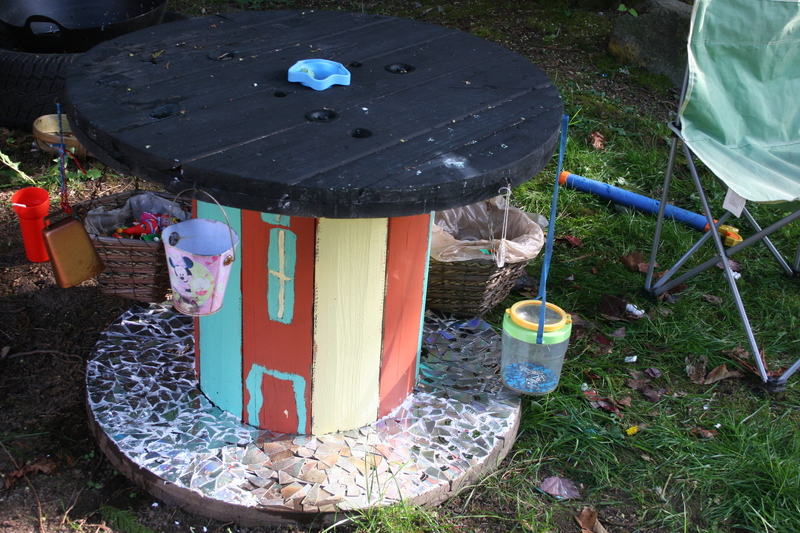 The good thing about the water table is that we can move it to different parts of the garden. It is perfect as a water source for the water wall . 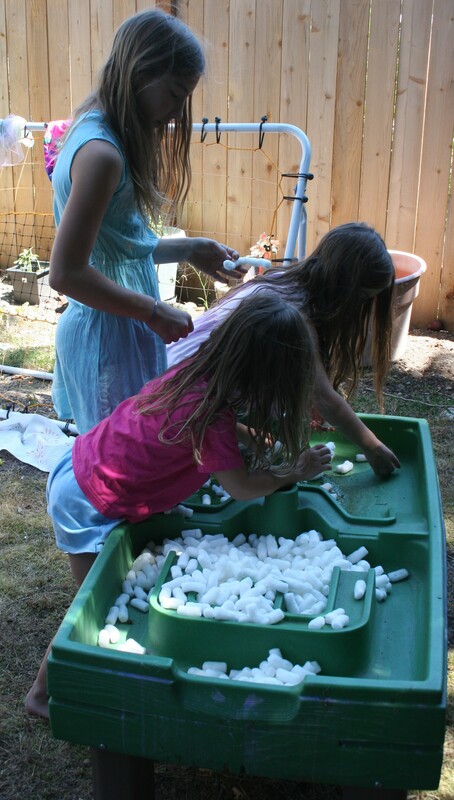 Other materials can also be used in the water table like the packing peanuts the children built sculptures with in the picture above. This is one of the children’s favourite activities and we have experimented with a variety of potion stations and mud kitchens. This is our current set up. The plastic tub was purchased very cheaply after Hallowe’en and fits perfectly inside a tyre. A split pallet in between is the workspace and another tyre with planks of wood laid over is where I set out materials for them to experiment with. Test tubes, containers and sticks for mixing are conveniently located in storage nearby. I didn’t know these mud tables existed until one was offered on my local Buy Nothing Group. It would be easy to make something similar with a washing up bowl on a stand. 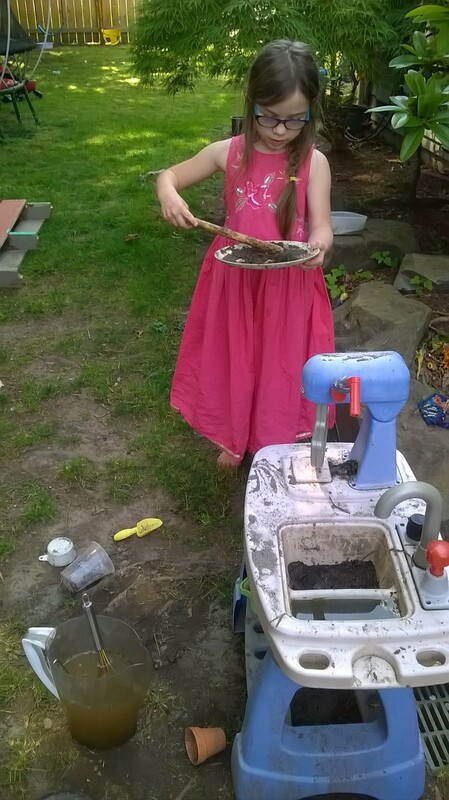 I have tried different positions for mud table and play kitchen and I am still unsure which works best. Currently they are close to each other but not in the same space so that the mud table, potion station and kitchen can be used together or separately. Storage on the trees. 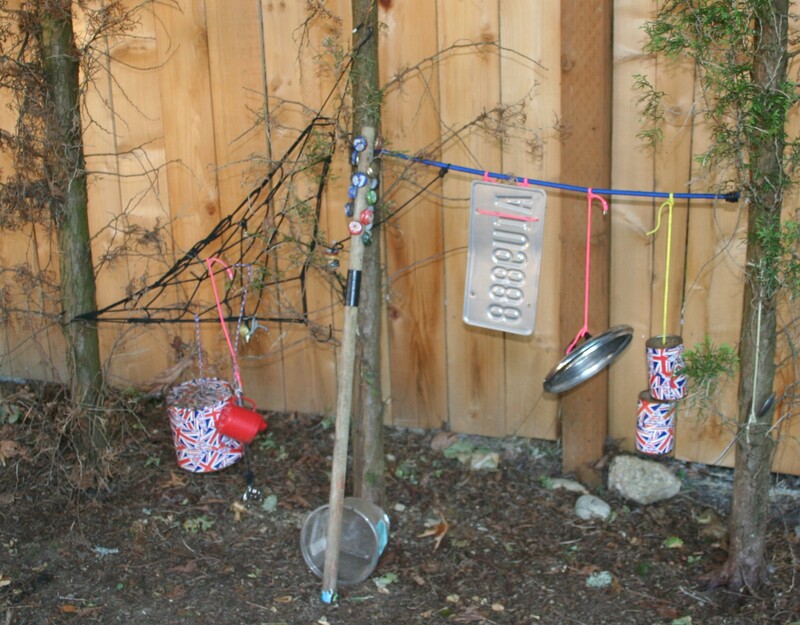 The containers hold kitchen utensils for the kitchen and pans hang on hooks screwed into the tree. 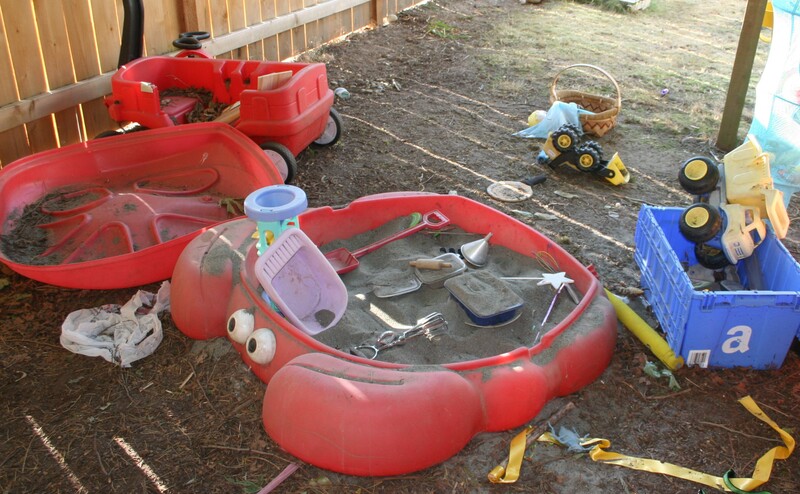 The children love this sandbox that I bought second-hand. It is really sturdy and has held out really well. The trees in our garden offer lots of shade so the girls can often be found making up imaginative games in the sandbox. I use a storage net from Ikea to store the smaller sand toys, water toys and small balls and hang it from a tree branch. 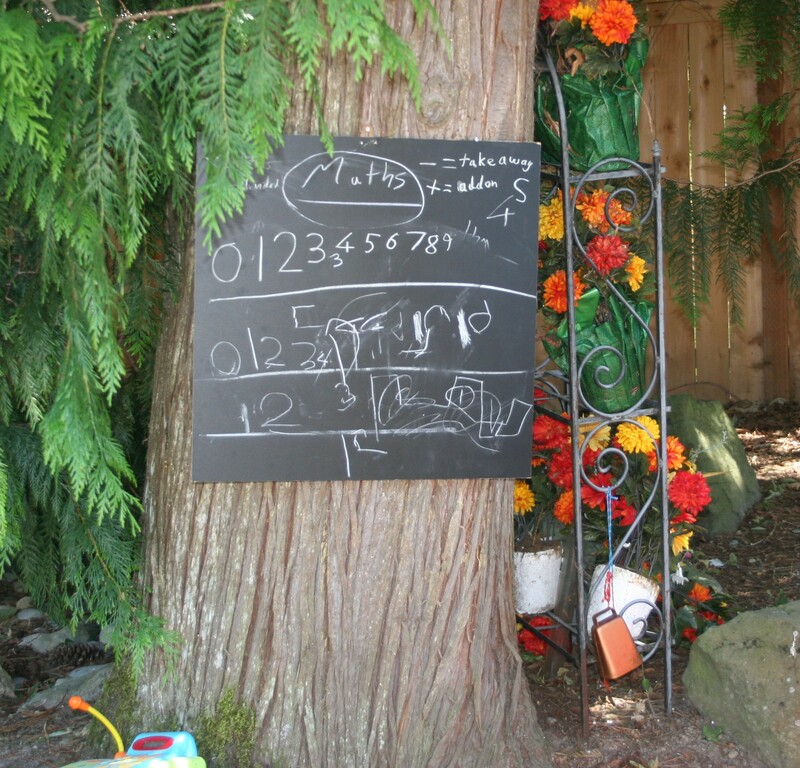 The girls are always making little paper signs to include in their play so I added a chalk board to the tree. I placed it near to their play shop so that they could use it as a sign. 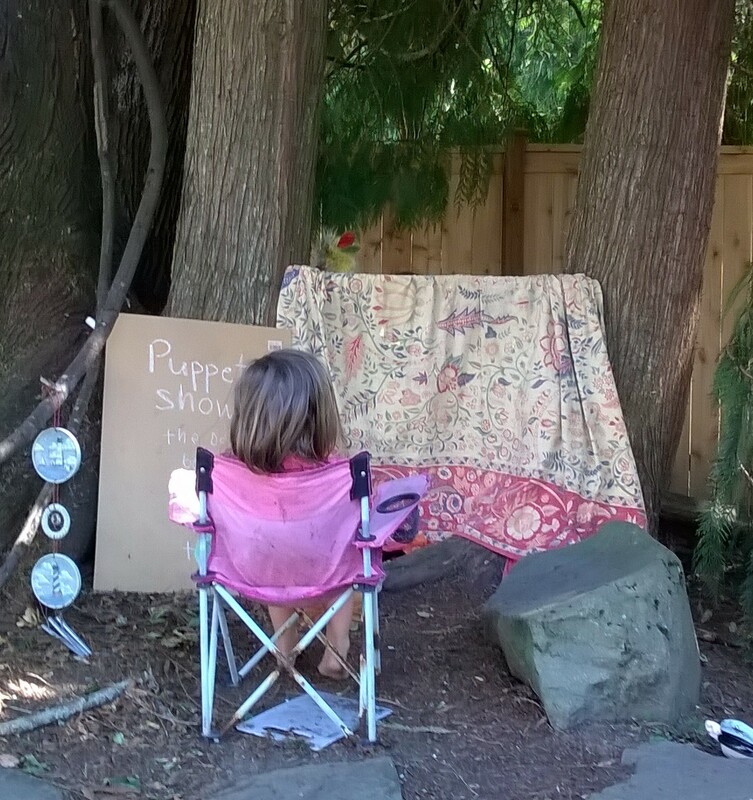 My eldest daughter created this puppet theatre using a sheet and a few sticks jammed between 2 trees. I nailed the sticks into the tree to stop them falling and added a board from a broken picture frame for them to write on. This could be painted with chalkboard paint but works just as well without. We were donated a large amount of fake flowers last Summer and we used them to create a flower shop using an old plant stand and their play till. 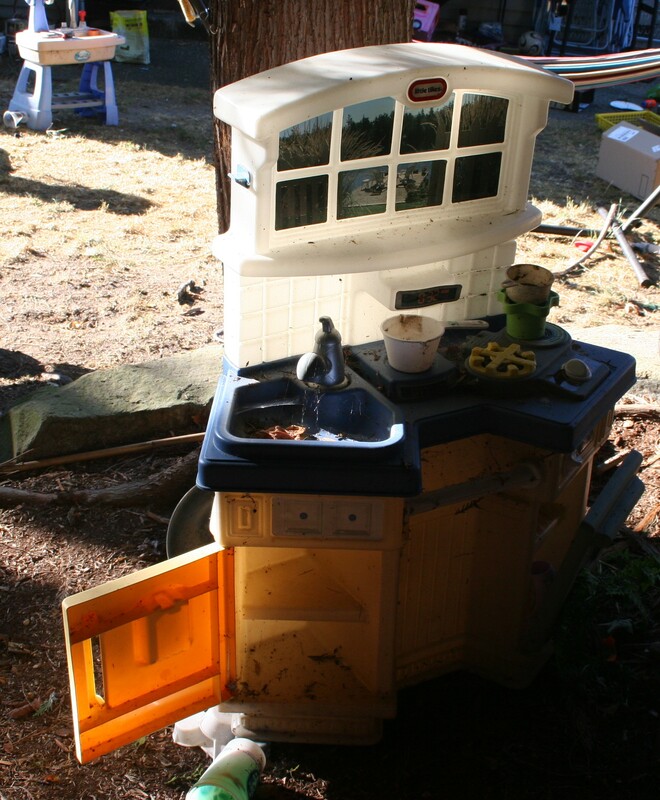 We could also use the puppet theatre with a table behind it. The girls use cars and waggons as the delivery vehicles. Another Ikea purchase but something similar could also be made using a hula hoop and ribbon or tulle. I hang it from a tree and put cushions and books inside. We also use a parasol for a shady spot. 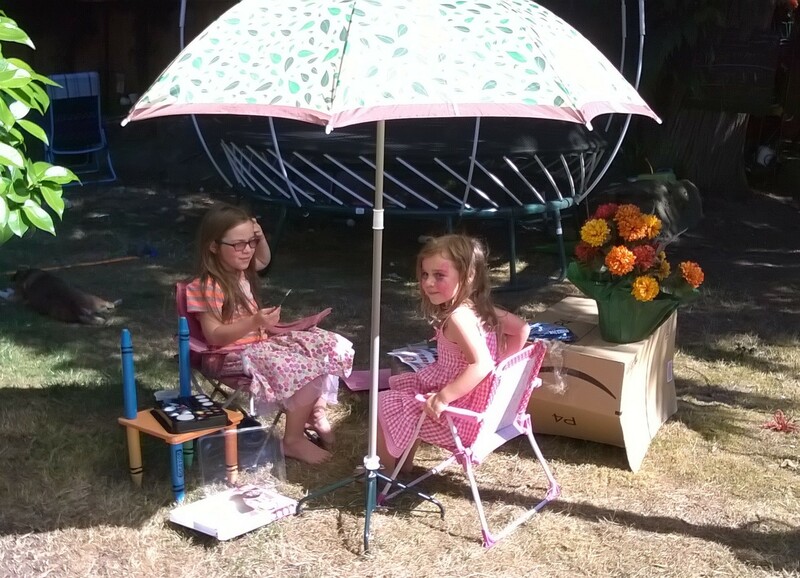 The girls recently created a face painting station beneath it. 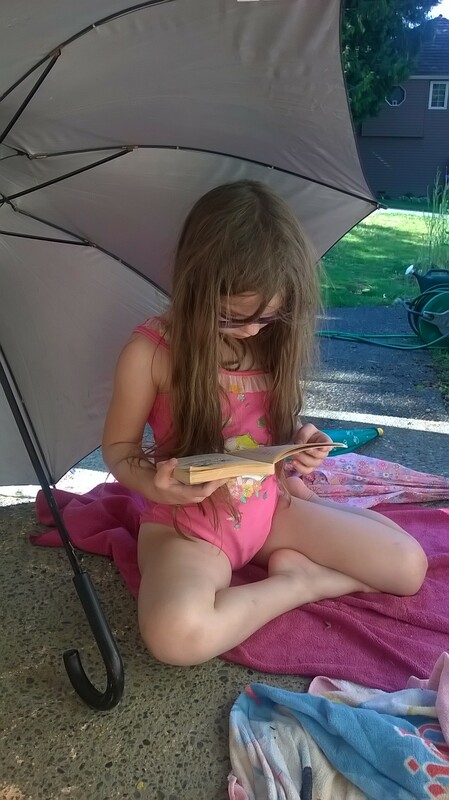 The parasol came with our water table and doesn’t have a stand. I used the stand for my Christmas tree. Sometimes they use my umbrella propped up on the porch for shade. 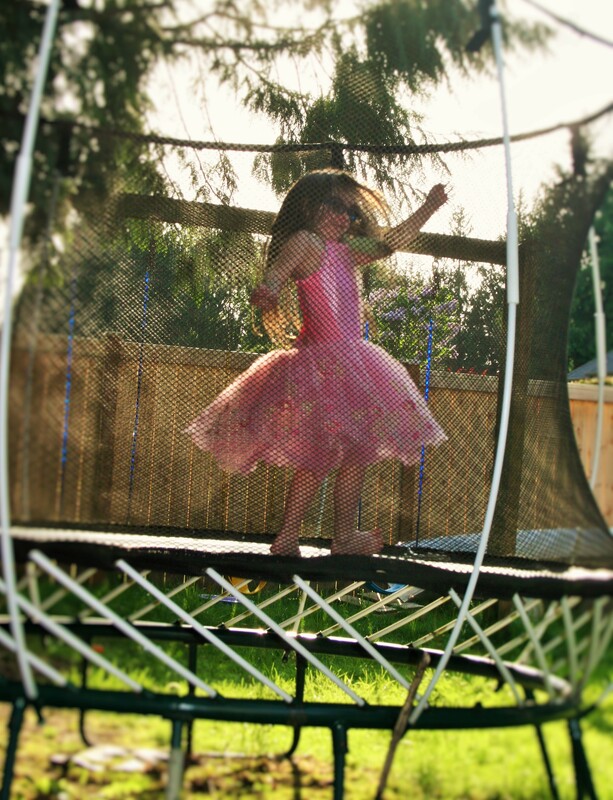 Of all of the things we have in the garden, the one that is used the most by all of the children, is the trampoline. We have a Springfree trampoline that I was lucky enough to win in a competition. They are not the cheapest trampolines but based on amount of use and durability, had I bought the trampoline, it would have been a worthwhile investment. The trampoline is overshadowed by trees so the girls keep a broom next to it and brush off fallen leaves and seeds before getting on. They have created a number of games to play, make up shows or practice gymnastics and often my eldest disappears to the trampoline for a bit of peace and quiet. 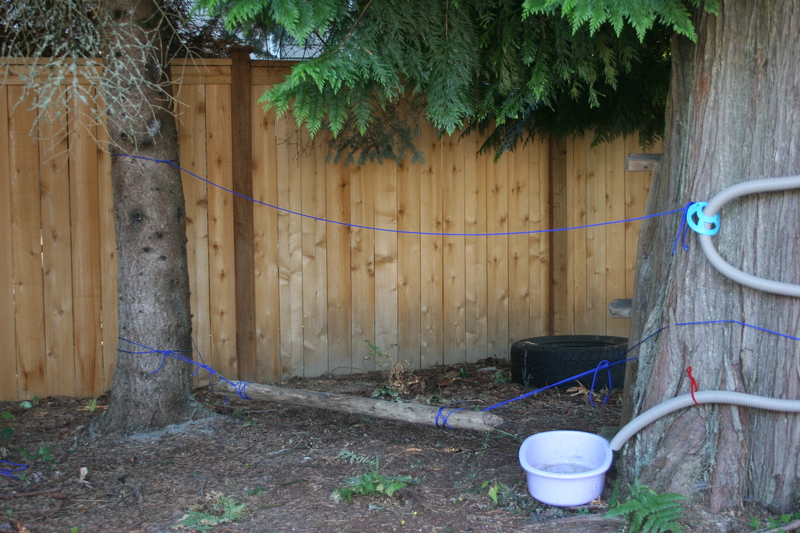 The balance beam is strung between 2 trees with paracord. 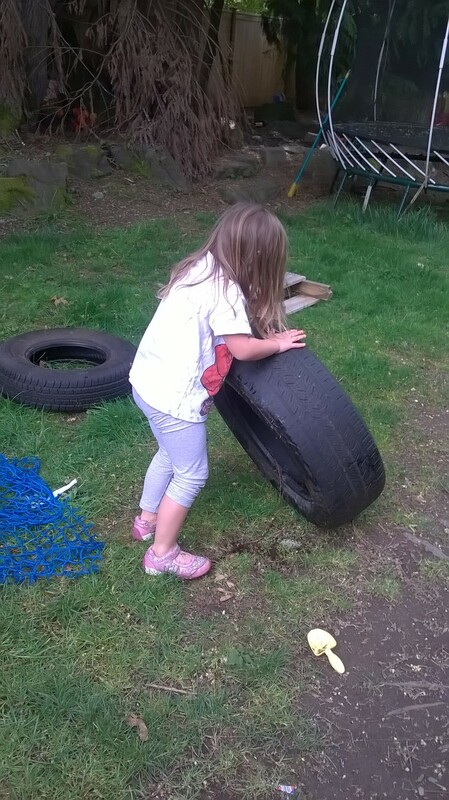 We use tyres to make obstacle courses. Getting rain water out of them is also an interesting challenge for my youngest. I’ve made ribbon sticks before using sticks bought from a craft shop. These sticks collected from the garden work just as well. The ribbon can be glued onto the sticks or simply tied. Ribbon sticks with multiple ribbons work well too. Our music garden is housed between small trees. We made a jingle stick by nailing metal bottle tops to an old broom handle. 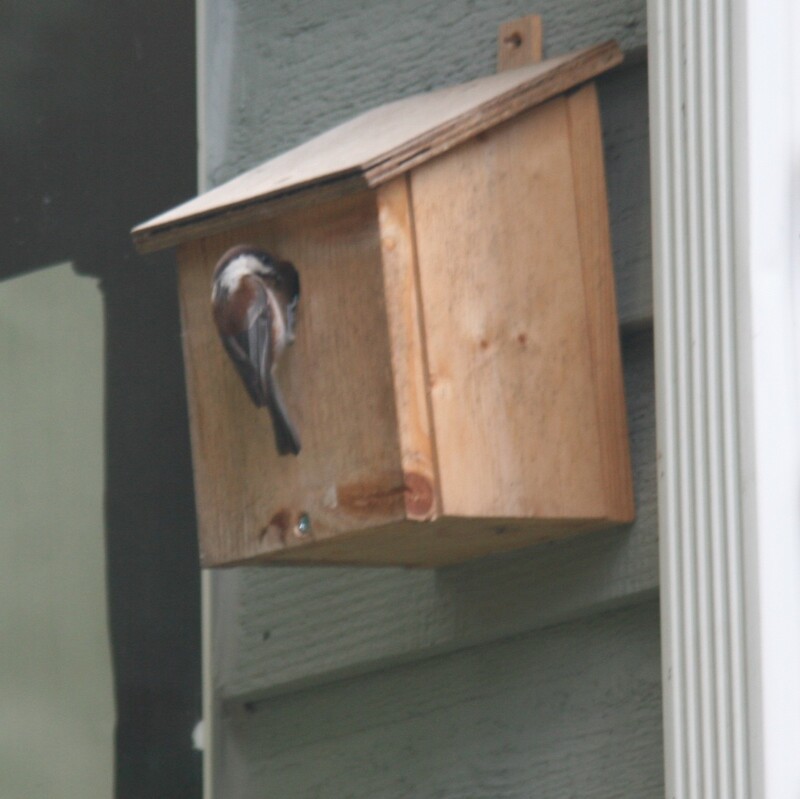 My daughter made this nesting box and this year for the first time we were rewarded with a family of nesting sparrows. You could hear the hungry little chicks as their parents flew close to them and we spent a lot of time lying in the hammock watching them going in and out of the bird house. 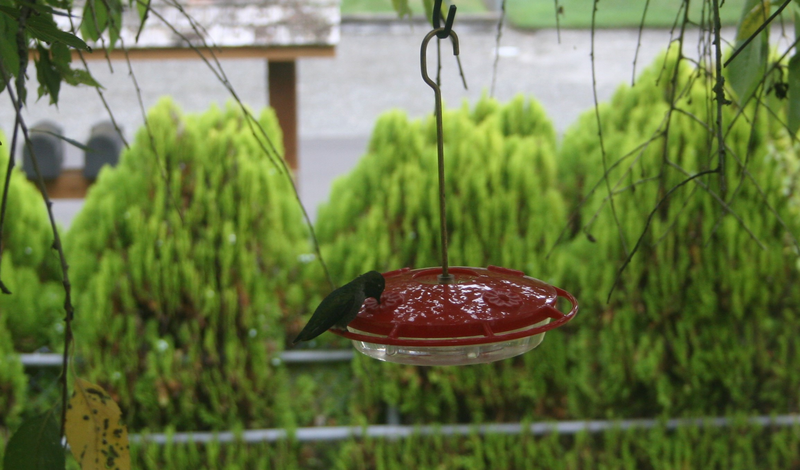 Other regular visitors are squirrels, hummingbirds and an occasional racoon. I am always interested in gathering new ideas for outdoor play spaces. If you are interested too, follow my Pinterest boards: Outdoor Play, Children’s Garden Inspiration and Forest School.